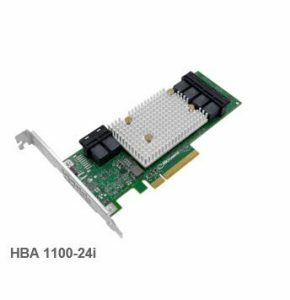 From enterprise servers using internalized data storage, to data centers using external data storage, the Microsemi Adaptec HBA 1100 family provides a robust, stable, and scalable solution that can handle the toughest system workloads and configurations. 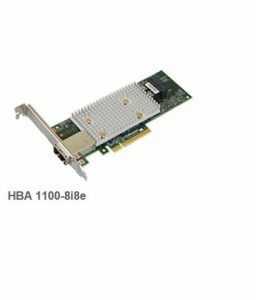 The HBA 1100 12 Gbps host bus adapters have an 8-lane PCIe Gen3 host bus interface, SmartIOC 2100 processor, MD2 low-profile form factor, and can be scaled to a maximum of 256 SAS/SATA devices*. 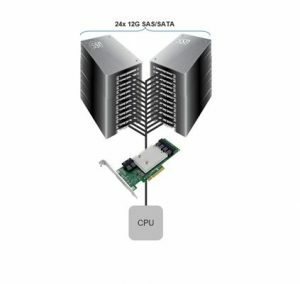 Not only does the HBA 1100 series offer over a 40% power savings compared to previous generations and significant power advantages versus competing solutions, HBA 1100 adapters can aggregate the performance of devices to the limits of the PCIe Gen3 host bus at 6.6 Gbps, and achieve up to 1.7M IOPS without additional overhead or latency. Available with its broad operating system support and ecosystem compatibility, the HBA 1100 is easy to implement and scale, connecting up to 24 internal or external storage devices. The unified maxView management tools and drivers across the Microsemi HBA, RAID, and expander solutions enable easy manageability across the entire product line. **Use of 8 internal ports for connectivity to RAID Adapter or HBA reduces maximum number of ports available for drive connectivity to 20. 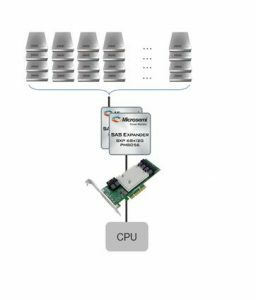 – Enables industry’s lowest expander count for drive configurations of hundreds of drives due to highest port count expanders in the industry = Even less power and cost! To learn more about the HBA 1100 series, please visit us at www.microsemi.com/smartstorage, connect with me on LinkedIn, or contact sales.support@microsemi.com. 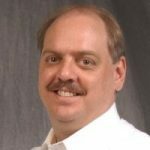 This entry was posted by Dave Steele on Monday, November 19th, 2018 at 5:00 am and is filed under Data Center, Storage. You can follow any responses to this entry through the RSS 2.0 feed. You can leave a response, or trackback from your own site.